Literacy Station Inspiration: Close Reading with "Thank You, Ma'am"
I may be behind the curve, but I am so excited to have been introduced to Kylene Beers's Notice and Note Signposts close reading strategies! No, I don't have the students use sticky notes to post all over a text - but I so think the "look fors" are wonderfully effective for close reading. 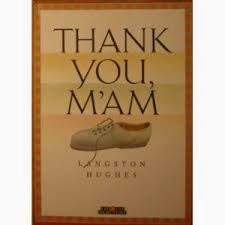 With my seventh and eighth-graders, we did a "cold read" of Langston Hughes's very short story, "Thank You, Ma'am" (after viewing a presentation and taking brief notes on each signpost). We did a second - close - read of the text with the graphic organizer below. Instead of asking why the signpost (event) is important, I found it more effective to ask students to make an inference, draw a conclusion, or make a prediction about either the future events of the story, the character, or the impact on the plot, conflict, or theme. It was great! The students were engaged, knew clearly what their goals were for the close read, and were able to analyze and understand the text much more deeply than with any other fiction reading strategy I have tried. Have you tried this strategy? I'm excited to hear about other texts that teachers have tried with the signposts and what kind of graphic organizers you've adapted that work for students! Please share! Click here for strategy handout.